Beulah Land is angry with God and with the good church people who viewed her as a shameful example and topic of gossip when she became pregnant at sixteen. They are all convinced they know Beulah’s story, but no one—not her Baptist preacher father who supposedly died from his daughter’s disgrace, her wooden-spoon wielding mother who told the pregnant Beulah never to return home, or the woman who came to her rescue—knows the true story. Ginger Belmont, Beulah’s piano teacher, gave the teenager a home when the Reverend and Mrs. Land cast her off, and in the nine years since, Beulah and Ginger have been family for each other. Ginger helped Beulah survive unthinkable tragedy, and Beulah cared for Ginger during a battle with cancer. Now that the cancer has returned, Beulah can’t say no to what may well be the last thing Ginger will ask of her, the request that Beulah take over as pianist of the County Line Methodist Church, a job Ginger can no longer perform. Beulah has spent years avoiding church, and she is not happy to return. She is much more comfortable with her regular gig playing piano and waiting tables at The Fountain, a honky-tonk across the road from the tiny Methodist church. She’s hardly surprised when Luke Daniels, the new pastor balks at her taking over Ginger’s musical duties. After all, she and the Preacher Man have already clashed over her mocking, jazzed up version of a hymn, a performance he termed a sacrilege when he heard it at The Fountain, but the preacher too finds it impossible to resist Ginger’s plan. So Sunday finds Beulah playing piano in church, but it is a choirless church since the choir refuses to sing if Beulah plays. Beulah, using a combination of charm, blackmail, and arm-twisting, recruits a new choir from the ranks of The Fountain’s regulars, a motley crew as out of place among the pious as Beulah is. Meanwhile, Ginger and Beulah’s family expands when another waitress at The Fountain is caught up in a situation that parallels Beulah’s past in several ways. And Beulah’s relationship with Luke alternates between an unorthodox courtship and conflict complicated by Beulah’s feelings of unworthiness. Kilpatrick’s first novel defies easy labels. Despite the role of church and faith in the story, the booze and the expletives and some scenes between Beulah and Luke place it outside the ranks of conventional Inspirationals. It has strong romantic elements, but Beulah’s journey is the central plot. Yet it is more saturated with issues of faith than is usual in women’s fiction. 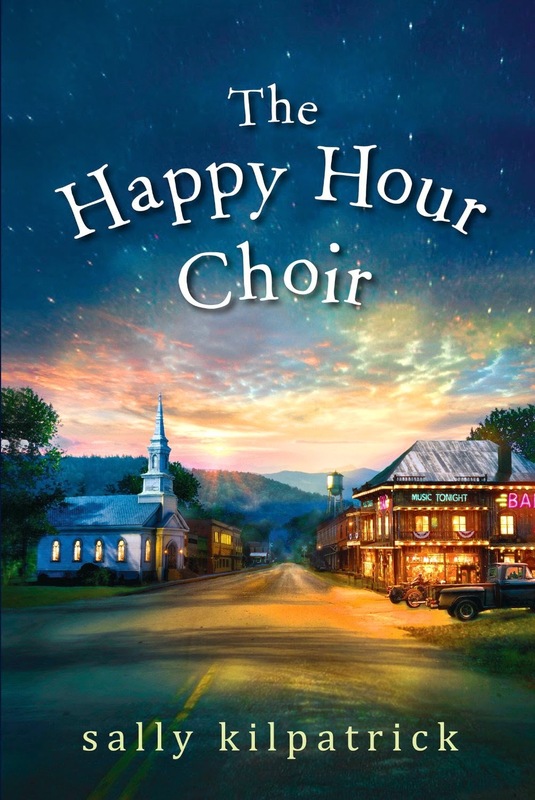 For those who need a category in which to place it, The Happy Hour Choir is probably best identified as Southern fiction. It is a tale with the strong sense of place and the quirky, eccentric characters that readers expect from the genre. Readers will find themselves rooting for Beulah to believe herself deserving of love and for her and Luke to overcome the obstacles that separate them. A secondary romance supplies a touch of sweetness, and the appropriately named Ginger adds humor and pathos. Kilpatrick is a debut author with a distinctive voice who deserves an audience. Romance readers who are willing to risk a novel that is about love on many levels and which offers an upbeat ending even if it is not really romance fiction should find, as I did, that this book is a rewarding read. I’ve added the author's forthcoming books, Bitter Sweet Creek (October 27, 2015) and Better Get to Living (2016), to my list of anticipated books. Sounds interesting. A person's faith is part of who they are. Using it in a story doesn't automatically put the book in the inspirational category. Often inspirational authors forget to develop their characters and let the story show how their faith influences their everyday lives. Instead, they spend the pages quoting scripture and preaching at the reader. Don't get me wrong, there are some excellent inspirational authors and I enjoy reading them. THE HAPPY HOUR CHOIR sounds like a good approach to the subject. It puts faith in the proper context - everyday life. Don't tell me how good a religious person you are, show me. It seems those who thump the bible don't necessarily live by its teachings. I will have to read this book.